Greg, Mardell, and Alexander Vreeland of the Great Northern Wisconsin Railroad, which is one of the only family-owned heritage railroad operations in the country. Greg Vreeland loves trains. 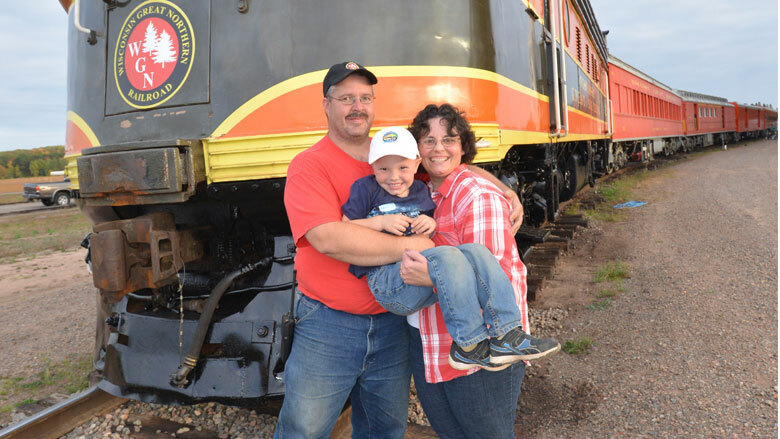 “They are big, colorful, and go places, and kids seem to be genetically programmed to love trains,” says the founder and co-owner of the Wisconsin Great Northern Railroad, located in Trego, a few miles from Spooner in Washburn County. Vreeland grew up in the rail-heavy port of Superior. A first-generation railroader with no relatives in the business, Vreeland says he would spend hours watching the Soo Line trains switch cars and tracks when he visited his grandparents in Cameron, just south of Rice Lake. At age twelve he become a junior transportation club member of the Lake Superior Railroad Museum in Duluth, and Vreeland continued working as a weekend tour guide and mechanical restorer for the museum into his twenties. In 1992, Vreeland met his wife, Mardell, whose shared interest in railroading created a match made in depot heaven. Almost immediately after the wedding, the couple established the Wisconsin Great Northern Railroad in hopes of creating a freight line. They set to work purchasing and repairing equipment, and quickly realized that they wanted to do more than just move cargo. “Passenger trains are my roots, and it was easy to shift focus … [to] offering passenger service,” says Vreeland. The couple launched their first excursion train as contractors for the North Shore Scenic Railroad between Duluth and Two Harbors, Minnesota. When the train took almost 10,000 passengers on the 25-mile trip that first year, they knew they were on to something. In 1997 the Vreelands leased seven miles of track near Spooner and moved their operation south to the Railroad Memories Museum housed in the former Chicago & North Western Railway Depot. Known as the “Crossroads of the North,” Spooner became a center of lumbering and railroading when the Omaha Railroad established a hub there in 1882. The railroad fueled Spooner’s economy, employing about half of the town’s population (six hundred people) at the turn of the century. The line was eventually absorbed by the Chicago, Minneapolis, St. Paul & Omaha Railroad (later becoming the Chicago & North Western Railroad); passenger service to the region stopped in the early 1960s. Because of the area’s historic relationship with the railroad, the Vreelands decided in 2013 to build the depot of their dreams in Spooner. Today, their Wisconsin Great Northern Railroad offers freight service five days a week—but freight is not their only focus. They offer up to three-hour passenger trips with a variety of food service as well as an overnight bed-and-breakfast ride. The once-seasonal railroad today employs 25 people and serves meals to around 15,000 guests each year. People come from miles around to enjoy everything from pizza to a formal, five-course dinner to bed-and-breakfast in restored cars dating from 1912 to 1950. The pizza excursions, serving pies from Tony’s Riverside in Spooner, are popular with families, as are Santa Pizza trains and three-hour trips for holidays such as Mother’s Day. For those desiring a shorter vintage train experience, a 45-minute jaunt in the “Doodlebug,” a restored 1913 self-propelled, trolley-type car retrofitted with tables and chairs, offers passengers a 360-view as they chug along. Most people opt for the dinner ride. Dinner guests arrive before the 6:00 pm boarding time. Conductor Lance Denotter reviews the passenger log for each of the eight cars and then the whistle blows long and loud, signaling final departure. The train is powered by No. 423, a Chicago & North Western F7 diesel locomotive painted in the line’s familiar green and orange and expertly piloted by engineer Lynton Brooks, who makes the weekly drive from International Falls to work on the train. While the train chugs along at a pleasant speed, passengers spy long-needled white pines that once fueled the region’s economic growth in the 1800s. Astonishingly abundant wildflowers, white-tailed deer, and wild turkeys make for exciting late summer viewing from linen-covered dining tables. “Bald eagles and the occasional bear are not uncommon sightings,” notes Beverly Jaskolski, a waitress and occasional night porter for overnight train guests. Abandoned telegraph poles with thick glass insulators run along the forested track, which at one point reveals an interesting junkyard crop of vintage cars. ATV riders, making use of the Wild Rivers State Trail, wave as they pass by. The train rolls by farmland as well as the backyards of residents living in small towns such as Trego and Earl. On the slow ride north, passengers nosh on seafood appetizers, green salads, bread, and bowls of wild rice soup, a local specialty. Entrées of steak, chicken kiev, pork ribs, wood-plank salmon, and cheese ravioli are all prepared on board by chef Paul Zirkle in the small kitchen car. Before the waitress delivers the entrées, the conductor urges passengers to stretch their legs and slip between the cars to take photos at the trip’s apex: Veazie Springs on the Namekagon River, which is part of the St. Croix National Scenic Riverway. This stunning view of the river and its tributary is accessible only by train, canoe, or kayak. The end-of-the-line stop provides diners with peaceful surroundings and an incredible vista from the high perch the train affords. As she pours the after-dinner coffee, Beverly shares a little of the area’s celebrated logging history. “There was once an earthen dam that would open to let the logs through to the Namekagon River,” she says. “You’ll see kayakers and canoes on the Namekagon from this vantage point.” Sure enough, a kayaker emerges among tall grasses, seemingly oblivious to the train as he traverses the still river. After the dinner train makes its reverse trip to the depot, diners disembark, and those staying overnight in the bed-and-breakfast train can step outside and enjoy the starlit northern sky from the depot’s patio, which is appointed with tables, chairs, and a roaring fire. Overnight can be an authentic, if cramped, experience in a 1950s sleeping car with upper and lower bunks, or a larger Pullman car with more spacious mahogany-trimmed staterooms that have private baths and three-quarter sized beds. “Through the years Mardell and I have traveled the country looking for the right cars to refurbish for our heritage railroad. Each has been chosen for a specific service and then carefully restored so it can be enjoyed for decades to come,” says Vreeland.